Lunch: We flew to Los Angeles today to visit my parents. 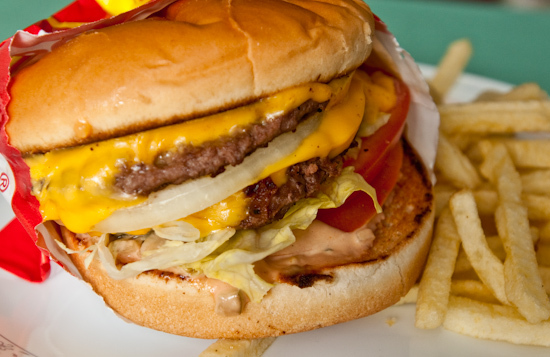 Immediately, after getting off the plane, I had my parents drive us to an In-N-Out Burger where I got a Double-Double with Fries. Dinner: For our first dinner in Los Angeles, I decided to try Yang Chow (6443 Topanga Canyon Boulevard, Canoga Park, CA‎ - (818) 347-2610‎) because it was one of the few Michelin listed Chinese restaurants with a location in the San Fernando Valley. After reading online reviews, I knew I had to try their Slippery Shrimp (which they claim on their website is world famous) and the hot and sour soup (which many report to be sinus clearing). The restaurant describes itself as Mandarin and Szechwan Cuisine, but none of the spicy dishes we ordered tasted like they were intended to authentically replicate Sichuan cooking. In fact, the whole experience was a little bit of a disappointment (we had high hopes) and it certainly is NOT one of the better Chinese restaurants in Los Angeles (at least not their Canoga Park location). 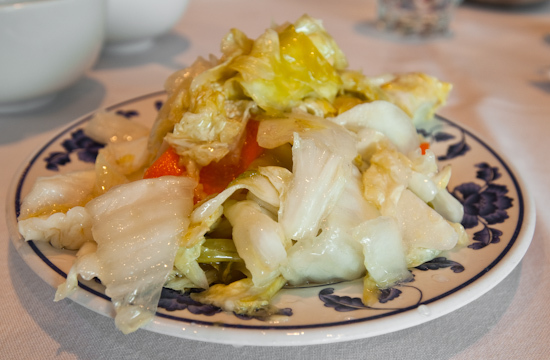 While we were waiting for our food, they brought out some pickled cabbage which was flavorful, but much too sweet. There was a pleasant mild spiciness attached to the flavor, but the sweetness was overwhelming. The Hot & Sour Soup ($6.50) (this was an order for 2 that we split between 4) is the best thing we had at the restaurant. The soup was sour, but not overwhelmingly so. The spice (from peppercorns) was well balanced and left a pleasing tickle in the mouth after swallowing. We felt that there were a lot of pleasant flavors and yet everything was kept in balance. Was it peppery enough to clear sinuses? Not even close. 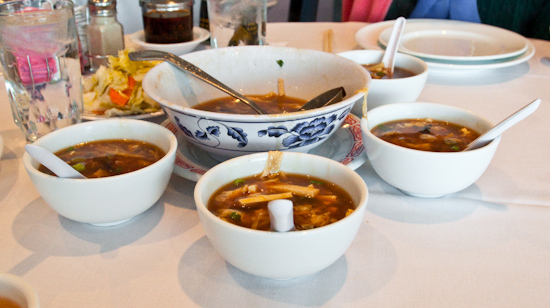 If I were to try to develop a hot & sour soup recipe, I'd try to achieve this mix of flavors. I would highly recommend this dish. 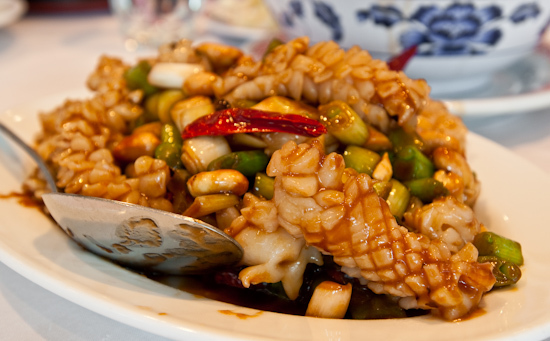 Next up was the Kung Pao Squid ($12.50). Given that they advertise themselves as serving "Szechwan" (sichuan) cuisine, I wanted to try either mapo doufu or something cooked kung pao style. Mapo doufu wasn't on the menu, so I picked Kung Pao Squid since it was listed as a specialty. Squid isn't easy to cook correctly - you have to be careful not to overcook it which means a quick cooking time - but it also means the flavor of the sauce won't get a chance to really enter the protein. They cooked the squid to perfect tenderness, but unfortunately, their sauce left much to be desired. There was barely any spiciness (this item had a star next to it on the menu to call out it's spiciness) and the flavors were fairly bland (except for a sweetness that became the main flavor profile of the sauce). On top of that, the sauce was too thin to properly coat the squid. This was the most disappointing dish of the night. 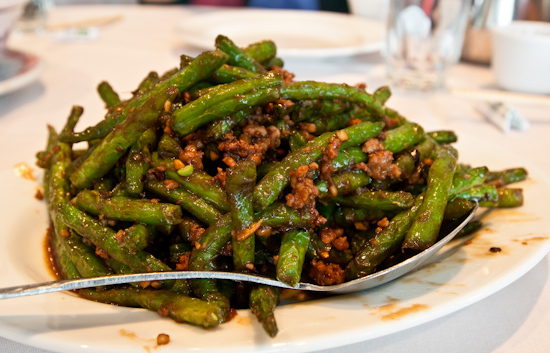 The Dry Sauteed String Beans with Minced Pork ($9.75) was pretty decent. Most of the string beans were cooked through but still crispy with the sauce clinging properly to them. A couple beans that I had were soft and mushy. Tina said that she felt like the flavor became more and more bland as she ate from the dish, but I didn't feel that was the case for me. This was also labeled spicy, but it was barely spicy. 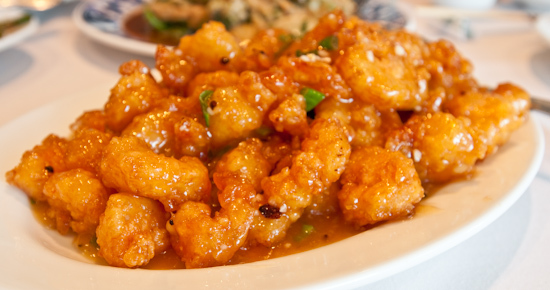 Slippery Shrimp ($14.25) turned out to be nothing more than a really good version of Panda Express's Orange Chicken but with shrimp instead of chicken. The sauce was saccharine sweet with strong orange citrus permeating throughout. The shrimp was nicely fried which provided an excellent crunchy texture that worked well with the cooked shrimp texture (soft and tender without a hint of rubberiness that overcooked shrimp degenerates into). This was clearly a dish formulated for the Western palate and not one looking for traditional Chinese flavors. I think I would have preferred it if the sauce were less sweet and more like orange peel chicken/beef than the syrupy orange juice that we got. Worth ordering if you love Orange Chicken and want to experience a great version of that Chinese-American fast food staple. Oh, this item was also marked spicy, but I couldn't taste any spiciness over all that sugar. Having had three spicy items that weren't spicy at all, I have to believe that they are very reluctant to add ample chilis to their dishes in general. Sauteed Rice Cakes with Pork Shreds ($9.25) was pretty decent. The rice cakes themselves need to be eaten with the sauce and some pork and vegetables for enough flavor, but the textures were very good. The rice cakes were soft and tender with just enough chewiness. At the end of the meal, both fortune cookies and a small stack of almond cookies were provided with the check. All in all, the food quality was not bad, but the recipes could have used some work. All their proteins were cooked just right - not undercooked or overcooked - and many of the textures were quite good. Their lack of spiciness when the dish calls for it and general tendency to cater to sweet palates makes it hard to rank this Chinese restaurant highly. If I were to assign a score to the food on the Fearless Critic scale, I'd probably place it at a 7.3 to 7.5 out of 10. If you like your Chinese food sweet and just barely spicy, then Yang Chow isn't a bad place to go. For me, I'll never return and seek elsewhere for good Chinese food. 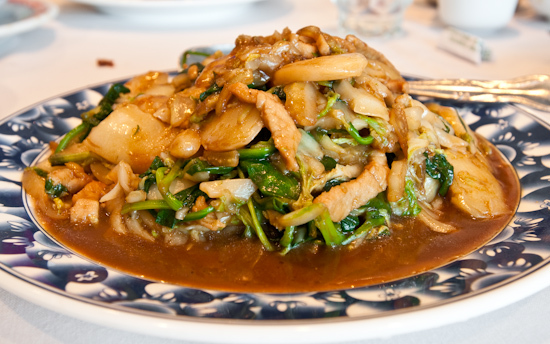 I remember liking Yang Chow, a million years ago, during High School. (It was our Chinese of choice back then). I specifically remember liking the string-beans and the slippery shrimp. I remember them as sweet but also spicy. I don't remember citrussy. But it could just be because that was 15 years ago! At any rate, I pretty much never expect anything in America to NOT be formulated for an American palette, much as I never expect anything in Japan NOT to be formulated for the Japanese palette. With Korea so close… you still get Japanese Korean food (etc). (Much as California eats Chicano cuisine under the name Mexican).